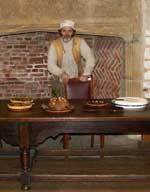 Historically Correct Feast and Banquet Service - Tudor, Stuart - Historical Management Associates Ltd.
Roman, Medieval or Dark Age Feasts also available. 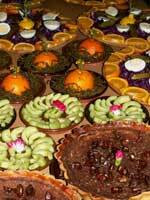 Our feasts are based on Gentry level dining at the period, feast can be designed for higher or lower status on request. We can provide the service in any location you provide but an additional travel charge of 50p per mile will be made if the site is more than 75 miles from Bristol. Banquets will be booked on a first come first served basis. £5 deposit secures a banquet date. 50% of the fee is paid by 3 weeks before the event and the balance on the night. Numbers can be increased [subject to the minimum levels] up to 4 days before the event. We are able to offer accurate historical feasts based on the research contained in over 40 publications on period food and the output of our 3 farms producing historical varieties of fruit, meat and vegetables.